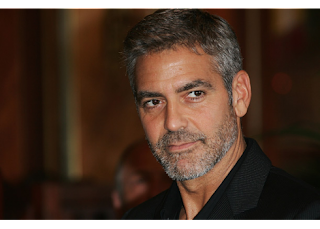 The Witty Ways of a Wayward Woman: Is George Clooney the only man ever to look good in a beard? Is George Clooney the only man ever to look good in a beard? Hmm...nice empty space there. Enough said. Does George Twitter? Nah, I can't believe he does - far too smart and if he ever did he'd probably pay some guy with a PHD to do it for him. Anyway, I have to admit to a really serious error of judgement. When I first dated Mr T he had a moustache. Yep, I don't know what I was thinking. I must've been having some serious PMT problems at the time. Fortunately, he got rid of it after a while. I can't remember exactly how long now but... ummmm... it could have been several years. What the hell was I thinking?! I'm definitely a gal for the clean shaven look....although I don't mean the David Beckham style which probably means waxing all over so he looks like Barbie's playmate Ken. Yuck. You know, I'm of the impression that hair is a good thing on a guy in certain areas.... 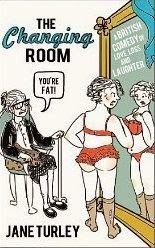 I mean have you seen some of those intimate areas, Ladies? Uh huh. They should definitely be covered up! They're just not a pretty sight are they? Yep, when "God created man in his own image" he was obviously having a bit of a bender. Let's face it; he did a grand job with women but when he got to man he'd run completely out of ideas and just did some doodling. Maybe he'd had a night out on the town and thought having dangly bits would be funny? He obviously didn't think of the problems of designing ergonomic underpants. Yep, show me a man happy with his underpants and I'll show you a man who wears braces. Anyway. It's now 6.36 and I'm off to have my brekky. It's hard life contemplating these issues and I need sustenance. Gez, it's tough being a Housewife Extraordinaire. Well, Mrs Turley, wait till you've gone through men-opause. ( I'll show you a piccy sometime - after he shaved it off he looked about 20 years younger - imagine my disappointment - I thought he was 65 and on his way out and I would just screw all his cash out of him:)) Then I realised he was much, much younger.....now I'm praying for Alzheimers. It must have been a thing at that time - I also had (notice the past tense) a penchant for moustaches - even young-looking Mr M sported one in his youth! Heh, the whole creationist thing doesn't sit well for men really. After all, if you were a guy building something, you have to be pretty drunk to finish it off like that :) "Yep, I know what this needs - something that'll get a laugh!" Too true Roxy, men are definately not good at the creationist thingy. This I know from observing Mr T and his experimentation with DIY. Personally I go for intelligence and humour; it would be a dull, dull life without any laughs:) Add in a pleasant face that doesn't remind me of Liberace's corpse and I'd consider a bloke "hot"! Still laughing. I actually think God did a decent job creating men and all that befalls the gender. Of course, that's easy for me to say as I don't have to contend with the maintenance and transportation issues. Nooo...when I have a beard, I look WAY better than I normally do. This may well be something to do with the fact you can see less of my face, which is always going to be better...but it doesnt matter. The question was does any man look good in a beard apart from Clowny. And the answer is hell yes. Now, now don't put yourself down! You're a handsome young fellow! Ahhh... The Las Vegas Ambulance service has arrived! Love the original comments:) Do you get discounts?! I am deliberating an answer. It's a tricky one. You put me in a bit of a tight spot, Chaunce. If I say "hot" your ego will be grossly inflated and if I say the opposite you'll be plummeted into the depths of writer's depression. I'm not sure I could bear the effects of either. However... I could write a Haiku about it tomorrow. Yes, that sounds like a good idea. A haiku it is!